IN the matter of the formal Investigation held at Westminster, on the 26th, 27th, and 28th days of July 1886. before H. C. ROTHERY, Esquire, Wreck Commissioner, assisted by Captains KNOX, R.N., RONALDSON and VAUX, as Assessors, into the circumstances attending the loss of the German Sailing Ship "FIDELIO" and of the lives of 7 of her crew through collision with the Steamship "Clan MacIntosh (1)," of Glasgow, near the Royal Sovereign Light Vessel on the 29th of November last. The Court, having carefully inquired into the circumstances of the above-mentioned shipping casualty, finds, for the reasons annexed, that the said collision was due to Samuel Beer, the master of the "Clan Macintosh," having kept the vessel going at too great speed, having regard to the state of the weather and to the place where they were, and to his having, when the red light of the "Fidelio" was reported on his starboard bow, ordered the helm to be ported, instead of stopping and reversing his engines, as it was his duty to have done. The Court, however, thinks that he used his best endeavours after the collision to find the "Fidelio" with a view of rendering assistance to her, and under the circumstances it will not deal with his certificate. Dated this 28th day of July 1886. This case was heard at Westminster on the 26th, 27th, and 28th days of July instant, when Mr. Mansel Jones appeared for the Board of Trade, Mr. Myburgh for the owners, master, and officers of the "Clan Macintosh," and Mr. Barnes for the owners, and Mr. Gibson for the representatives of the deceased master of the "Fidelio." Ten witnesses having been produced by the Board of Trade and examined, and the deposition of a witness taken at Glasgow having been put in and read, and a witness having been also produced and examined by Mr. Myburgh, Mr. Mansel Jones handed in a statement of the questions upon which the Board of Trade desired the opinion of the Court. Mr. Barnes and Mr. Myburgh then addressed the Court on behalf of their respective parties, and Mr. Mansel Jones having been heard in reply, the Court proceeded to give judgment on the questions upon which its opinion had been asked. The case of the "Fidelio," which was a wooden German vessel of 375 tons register, belonging to the Port of Uckermnde, is as follows She sailed from Wilmington, in the Southern States of North America, with a crew of 10 hands, and a cargo of timber, bound to Wolgast in Prussia, and on the 29th of November last had arrived in the English Channel. At 4 p.m. of the same day she was running up the Channel, steering about E., with the wind blowing a fresh breeze from west to S.W., when all hands were called to shorten sail. Having taken in the upper main topsail, she continued her course to the east under foresail, fore topmast staysail, fore and main lower topsails, and reefed upper fore topsail, making from 3 to 4 knots an hour; and the weather being misty with drizzling rain, all hands were kept on deck to be ready, in case their services should be required. At about 6 p.m. the weather cleared up, and they then saw the light of the Royal Sovereign Lightship on their port bow, and Beachy Head Light away on the port quarter. At this time the master and the mate were on the top of the cabin, the carpenter and one seaman were on the port quarter, another seaman was on the starboard quarter, and three others of the crew were forward, the steward and cook being below. In about half an hour afterwards, and when about abreast of the Royal Sovereign Lightship, the carpenter, who was on the port quarter, observed a white light a little on the port bow, but he did not report it; shortly afterwards he saw the white and green lights of a steamer a little on the starboard bow, and these he duly reported. The lights, we are told, appeared to get broader on the starboard bow, and when about three to four points on the bow, the green light suddenly disappeared, and the red light appeared and in a very short time afterwards she came into them, striking them a little abaft the main rigging on the starboard side. She then rebounded, and came into them a second time a little further forward, smashing in the side. The crew then attempted to get out one of the boats, but the vessel falling over on her port side rendered it impossible to do so, and they then got on the starboard side, which was out of the water, three of them taking to the fore chains, and the remaining seven to the mizen chains. They continued to see the lights of the steamer, and after a time she approached them to within three or for ships' lengths, and they then saw that she had three red lights at her masthead, and there was an electric light on board. After a time the three red lights were hauled down, and the bright light was replaced, and she then proceeded on her voyage down Channel. The "Fidelio " then lay at the mercy of the wind and waves, the sea continually breaking over her; and during the night the three men in the fore chains, and four out of the seven men in the mizen chains were washed overboard and drowned. But before daylight a steamer came up, took the three survivors out of her, and subsequently landed them at Belfast, and we are told that they have almost ever since been more or less in the hospital. The "Fidelio," it seems, was subsequently picked up waterlogged, and still lying on her beam ends, and was taken into Dover, where I understand she has been since broken up and sold. 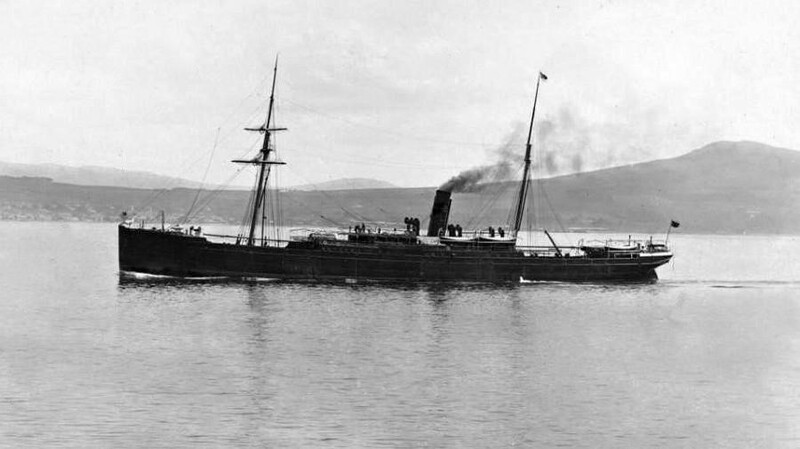 The case of the "Clan Macintosh" is as follows She is an iron screw steamship, belonging to the port of Glasgow, of 3985 tons gross, and 2635 tons net register, and is fitted with engines of 600 horse-power. She was built at Greenock in the year 1883, and at the time of the casualty, which forms the subject of the present inquiry, she was the property of Mr. Charles William Cayzer, of No. 109, Hope Street, Glasgow, and others, Mr. Cayzer being the managing owner. She left London early on the morning of the 29th of November last, with a crew of about 100 men, a cargo of 700 tons of general merchandize, 490 tons of water ballast, and 200 tons of coals, bound to Glasgow. At about 2 pm. the same day she landed her pilot off Dover, and at about 4 p.m. passed Dungeness, distant about 3/4 of a mile, and was then put upon a W. by S. course, magnetic, to make the Royal Sovereign Lightship. We are told that from this time it was blowing a strong gale from the W.S.W., with drizzling rain, and that the vessel was going at what the captain called "easy full speed," whatever that may mean, making according to his view 7 1/2 to 7 3/4 knots. At about 6 p.m. the chief mate came on the bridge, and from that time until the time of the collision the master, chief officer, and channel pilot were on the bridge; there was a quartermaster at the wheel, which was on the upper bridge, the vessel being steered by steam, and there were a quartermaster and two Lascars forward on the look-out. A few minutes afterwards the light of the Royal Sovereign Lightship was seen about two points on the starboard bow, and was duly reported; and in about 10 minutes or a quarter of an hour afterwards, a red light was observed about a point on the starboard bow, upon which the master, believing it to be a vessel close hauled on the starboard tack beating down channel, ordered the helm to be ported so as to pass under her stern. The vessel at once began to answer her helm, but before they had got the light ahead, and whilst it was still about a quarter of a point on the starboard bow, the red light suddenly disappeared, and a green light appeared; upon which the master at once ordered the helm to be put hard-a-port, repeating the order a second time, and he then telegraphed to the engine room to stop and reverse full speed. The vessel continued to pay off, but they were then so close that almost immediately afterwards they came together, the steamer striking the sailing vessel on the starboard side. Orders were at once given to get out one of the starboard boats, and in about 8 minutes from the time of the collision the boat pushed off with the first and second officers, two quartermasters, and five Lascars in her. In the meantime the other vessel had disappeared, but shouting was heard apparently in a foreign language, and they pulled away to the S.E. in the direction in which they thought the vessel had gone. Three red lanterns were then hoisted at the masthead, and by steaming ahead and astern the vessel was kept in close proximity to the boat. We are told that the vessel was lighted with electricity, and that the master ordered the windows and doors of the cabin and state room to be opened, so as to indicate the vessel's position; two blue lights were also burnt. After pulling about till nearly 9 p.m., but without seeing anything, the boat returned to the steamer, and was hauled up; and the vessel then proceeded on her course to the westward under easy steam, keeping a good look-out in every direction, but without seeing anything of the other vessel. These being the facts of the case, the first question upon which our opinion has been asked is, "Whether " the ' Fidelio' was the vessel run down by the ' Clan " Macintosh' on the evening of the 29th of November " last?" Now if the "Fidelio" was not the vessel with which the "Clan Macintosh" came into collision, there must have been two collisions between a steamer and a sailing vessel on the same day, at about the same spot, and at about the same time; in each of which the sailing vessel must have been a barque with foreigners on board, and the steamer a large vessel rising high out of the water, painted black, with a black funnel, an upright stem, and no bowsprit; and they must have come together in the same way, the bows of the steamer with the starboard side of the sailing vessel. After the collision, too, the steamers must have remained on the spot, and must have hoisted three red lights to the masthead, and they must both have been lighted with the electric light. Such a coincidence, to say the least, would be very remarkable, the more so as there is no evidence that there was any other collision but this at or about that spot on the night in question. Looking at all the facts of the case, the perfect consistency, as I will presently shew, of the story told by the witnesses from the "Fidelio" with that told by the "Clan Macintosh," we have no hesitation in saying that in our opinion the "Fidelio" was the vessel that was run into by the "Clan Macintosh." This being so, I will now proceed to deal with the second question, which is, "Whether both vessels com- " plied with the regulations for preventing collisions " at sea; and especially whether the ' Clan Macintosh' " complied with Articles 13, 17, and 18 of such regulations?" Before proceeding to deal with this question, it may be well to state how, according to the view which the Court takes of the case, the collision occurred; and in doing so I think that we shall have no difficulty in reconciling the apparently contradictory statements of the witnesses, which it is always desirable to do, whenever it is possible. We are told that the "Fidelio" was steering east, and the "Clan Macintosh" W. by S., so that their courses would be crossing at an angle of one point; and consequently when the "Clan Macintosh" had arrived at the point of intersection of the courses, or in other words was directly ahead of the "Fidelio." she would have that vessel one point on her starboard bow. It will also be seen that, before the "Clan Macintosh" had reached that point, she would have the red light, and after she had passed it, the green light of the "Fidelio" open to her on her starboard bow; whilst the "Fidelio" would have the lights of the "Clan Macintosh" at first on her port bow, and afterwards on her starboard bow. And this would seem to be exactly what occurred; and if so, then the porting of the "Clan Macintosh's" helm, and the keeping it to port, when she had got on the "Fidelio's" starboard bow, would necessarily bring her into the "Fidelio's" starboard side, without its being necessary to suppose that the "Fidelio" had starboarded her helm. This, then, being the view which we take of the case, we will now proceed to answer the question which has been put to us, whether both or either of the said vessels complied with Articles 13, 17, and 18 of the Regulations. Now Article 13 is in these words: "Every ship, " whether a sailing ship or a steam ship, shall in a fog, " mist, or falling snow, go at a moderate speed." As to the "Fidelio," she was under foresail, fore topmast staysail, two lower topsails, and reefed upper fore topsail, and was, we were told, going at the rate of from 3 to 4 knots; and we have no reason to think that she was not going at a moderate speed. According to her master, the "Clan Macintosh" was going at easy full speed, and was making from 7 1/2 to 7 3/4 knots, which would certainly not be an immoderate speed for a vessel of her size and character; but how stand the facts? We were told that she dropped her pilot off Dover a little after 2 p.m., and according to the entry in the log book she seems to have passed Dover at 2.10, and to have reached Dungeness at 3.50. Now the distance from Dover to Dungeness is 17 1/2 miles, and according to the pilot she had whilst running this distance a tide against her of about 2 1/2 knots, making the total distance from 21 to 22 miles, which we are told she did in 1 hour and 40 minutes, giving her a speed of more than 12 knots through the water. Again, the distance from Dungeness to the Royal Sovereign Lightship is 24 miles, and during that time the pilot told us that she would have a tide against her of about 1 1/2 knots, making the total distance 27 knots, and this she seems to have done in about 2 hours and a quarter, or 2 hours and 20 minutes, giving us again a speed through the water of about 12 knots. The chief engineer, indeed, who did not give his evidence in a very straightforward way, tried to make out that she was only going about 8 knots, the slip of the screw, he said, being 33 per cent. ; but in thus arriving at the vessel's speed, he seems to have made no allowance for the three hours or so that the vessel was lying to, going now ahead and now astern, whilst they were looking out for the vessel with which they had been in contact. Moreover, he is distinctly contradicted by the entries in his own log book, which state that he had orders to go at full speed from the time of landing the pilot until just before the collision, and that he had a full head of steam on of 84 or 85 lbs., which would have enabled him to do so. But whatever the chief engineer may say, it is clear from the distance run in the time that the speed of the vessel, instead of being as the master stated 7 1/2 to 7 3/4 knots, was nearer 12 knots; was this then a moderate speed, considering the state of the weather and the locality? According to the evidence from the "Clan Macintosh," the weather was misty with a drizzling rain, which would render it difficult to see objects at any distance; and that it was so is obvious from the fact that they did not see the light of the Royal Sovereign Lightship, much less the lights of the "Fidelio," until they had got very near to them. It was said by the witnesses from the "Fidelio" that at that time the weather had cleared up, but it is quite possible that it may have been clear for the "Fidelio," which was coming from the westward, and yet misty and thick for the "Clan Macintosh," which was coming from the eastward. It must also be remembered that the Royal Sovereign Lightship is a point for which all vessels, whether coming into or going out of the channel, make, so that the master might reasonably expect at all times and in all seasons to find a large number of vessels in its vicinity. Under these circumstances, and looking at the condition of the weather, the assessors are of opinion that the speed at which this vessel was going, namely from eleven to twelve knots an hour, was not a moderate speed within the terms of the 13th Article of the Regulations. The next Article to which our attention has been called is the 17th. "If two ships, one of which is a " sailing ship, and the other a steamship, are proceeding in such directions as to involve risk of " collision, the steamship shall keep out of the way of " the sailing ship." Under this rule then it was clearly the duty of the "Clan Macintosh" to keep out of the way of the "Fidelio," and the reason which she gives for not having done so, is that the "Fidelio" starboarded her helm, thus throwing herself across her course; whereas, if the "Fidelio" had not done so, she would have gone clear. The three witnesses who have been examined from the "Fidelio," the carpenter and the two seamen, speak very positively as to no order having been given to alter the helm, and as to no alteration of the helm having been made previous to the collision. It is true that these men were at the time aft, and in close proximity to the wheel, but their evidence on such a point would not have the same weight as that of the master and mate, who were directing the navigation of the vessel, or of the man who was at the helm would have; but these three men were unfortunately drowned. There is, however, a fact which would lead us to think that the helm of the "Fidelio" may have been starboarded at the last moment, namely, that if she did not do so, we have some difficulty in understanding how the vessels could have come together in the way in which they are represented to have done. Both the pilot and the man at the wheel told us that they took the bearing of the vessel's head at the moment of the collision; the former, who took it by the standard compass, which was on the after part of the bridge, said that her head had gone round from W. by S. to W.N.W., and the man at the helm, who took the bearing by the steering compass, said that it went round from S.W. by W. 1/2 W. to W. 1/2 N. Now, if the evidence of these persons is to be believed, and I do not know why it should not be, the alteration of the "Clan Macintosh's" course previous to the collision was only three points; and if the "Fidelio" kept her course, their courses would be crossing at an angle of two points only. But, if so, it is somewhat difficult to understand how the two vessels could have come together in the way deposed to by the witnesses from the "Fidelio," or how the damage shewn in the photographs produced could have been done; to reconcile these facts the courses must at the moment of collision have been inclined at a greater angle to one another. It is this fact which leads us to think that the "Fidelio" may have starboarded her helm at the last moment, and thus thrown her head to port, which would bring about the collision in the way shown. But if this was done at the last moment, and there is nothing to show that it was not, it would not relieve the "Clan Macintosh" of her responsibility for bringing about the collision. The next Article to which our attention has been called is the 18th Article, which is in these words: "Every steamship, when approaching another ship so " as to involve risk of collision, shall slacken her speed, " or stop and reverse if necessary." When the "Clan Macintosh" first saw the red light of the "Fidelio," it bore about a point on her starboard bow. This is obviously a position of danger, and one likely to involve risk of collision; and under those circumstances it was the steamer's duty to have stopped and reversed her engines, instead of which the master assumed that she was a vessel beating up Channel, close hauled on the starboard tack, and he thought that by porting his helm he would pass under her stern. The assumption, however, was not well founded, for the "Clan Macintosh" was running up Channel, and the porting her helm under these circumstances would of necessity bring her directly down on the "Fidelio." We think therefore that the "Clan Macintosh" did not comply with this article of the Regulations. The third question which we are asked is, "Whether " a good and proper look-out was kept on board both " vessels?" We are told that all the hands on board the "Fidelio," except of course the steward who was attending to his duties in the cabin, were on deck, the master and mate being on the top of the cabin, 2 men on the port quarter, 1 on the starboard quarter, and 3 forward, and apparently they were keeping a good look-out. At the same time it must be observed that the lights of the "Clan Macintosh," which it may naturally be assumed were fine lights, were not seen until the vessels were very close to one another; and when they were seen, they were seen not by the captain or the mate or the persons forward, but by one of the men who was on the port quarter. There may therefore not have been so good and proper a look-out on board the "Fidelio" as there might have been. At the same time it must be observed that there was no obligation on her to do anything except keep her course, and the fact that she did not see the lights of the "Clan Macintosh" until the last moment would tend to show that in all probability she would not have altered her helm, if at all, until the last moment. As regards the "Clan Macintosh," however, the case is different; it was her duty to get out of the way, and for that reason it was her duty to keep a good and vigilant look-out. Now Murray, the quartermaster, who was on the lookout, in the deposition which has been brought in, states that he went on the look-out at a quarter after six, and that the light of this vessel was seen within five minutes afterwards. It is perhaps owing to this circumstance that the light was not seen until the two vessels had got very close together. Apart, however, from this fact, we have no reason to suppose that there was not a good look-out being kept by the master, the chief officer and the pilot on the bridge. The fourth question which we are asked is, "Whether " the master of the "Clan Macintosh" complied with " Section 16 of the Merchant Shipping Act, 1873?" The section in question is in these words: "In every " case of collision between two vessels, it shall be the " duty of the master or person in charge of each vessel, " if and so far as he can do so without danger to his " own vessel, crew, and passengers (if any), to stay by " the other vessel until he has ascertained that it has " no need of further assistance, and to render to the " other vessel, her master, crew, and passengers (if " any) such assistance as may be practicable, and as " may be necessary, in order to save them from any " danger caused by the collision." Now it is clear that the "Fidelio" and the lives of those on board were in danger, and that the "Clan Macintosh" did not rescue them, but we think that the master and officers of the "Clan Macintosh" have given a very good explanation of their conduct. It seems that the boat was lowered and sent off within eight minutes of the collision, with the chief and second officers, two European quartermasters, and five lascars in her. Whilst the boat was being got out, the third officer was set to watch the vessel to see in which direction she went, and a man was sent up aloft to keep an eye on her. It was very dark at the time, and the vessel had consequently been lost sight of before the boat had been got off; but the third officer told them that he had last seen her in a south-easterly direction, and accordingly they pulled away in that direction. At that time they did not know that the "Fidelio" had fallen over on her beam ends, with her sails in the water, and that she would consequently drift with the tide, which had then begun to run to the westward; whereas the steamer being out of water, and with her broadside exposed to the wind, would drift before the wind up channel to the eastward. In this way the vessels would soon get separated, and all attempts on the part of the "Clan Macintosh" to find the other vessel would be useless. We think that there is not the slightest ground for saying that the master of the "Clan Macintosh" did not use every exertion to discover the other vessel. The fifth question which we are asked is, "Whether " both vessels were navigated with proper and seaman. " like care?" There is nothing to show that the "Fidelio" was not navigated with proper and seamanlike care; it was her duty to keep her course, and she seems to have done so very nearly, if not quite up to the time of the collision; and although there is some reason to think that she may have starboarded her helm at the last; if she did so, it would not be a ground for condemning her. As regards the "Clan Macintosh," however, there are several charges against her. In the first place we think that, looking at the state of the weather and at the locality, she was not going at a moderate speed. Secondly we think that the master acted too hastily, when he saw the red light, in assuming that she was a vessel beating down channel close hauled on the starboard tack, and that it would have been better, had he then stopped and reversed his engines, until he had made out what course she was on. Thirdly we think that, when the red light disappeared and the green light appeared, seeing that the light was still on his starboard bow, and that the steamer was being steered by steam, it would have been better, had he then ordered the helm to be put to starboard instead of being put hard-a-port, in which case we think that he might perhaps have cleared her. The sixth question which we are asked is, "Whether " the master and officers of the ' Clan Macintosh' are " or either of them is in default?" And it is added that "in the opinion of the Board of Trade the certificate of the master of the "Clan Macintosh" should " be dealt with." It is admitted that the whole blame of the collision rests with the master of the "Clan Macintosh," and the question is, whether his certificate should be dealt with. As regards his conduct in porting his helm, and not stopping and reversing, when he first saw the red light, and in not starboarding when the green light appeared, we think that they amount to mere errors of judgment, for which we never deal with a master's certificate. The act, however, of going at a speed of about 12 knots on such a night and at such a spot is a more serious offence. He seems to have thought that he was not going at that great speed, and that objects could be seen at a much greater distance than they in fact could be. On the whole the assessors are disposed to take a lenient view of his case, and we shall therefore not deal with his certificate.